ENERMAX presents the LIQTECH II family of all-in-one liquid CPU coolers for AMD and Intel sockets. The ENERMAX LIQTECH II offers enthusiast-grade cooling capability supporting up to 500W+ TDP processors with the exception of the AMD TR4 socket processors. The LIQTECH II featuring RGB lighting that supports motherboard-based RGB lighting control applications for customisation and synchronisation with advanced motherboards featuring addressable RGB headers. The LIQTECH II coolers feature the new Aurabelt water block with addressable RGB lighting. The ENERMAX LIQTECH II uses a robust EF1 pump, a ceramic nano PI bearing pump that delivers a high flow rate of up to 450L/H for superior cooling performance. It also features the ENERMAX patented SCT (Shunt-Channel-Technology) cold plate design helps eliminate the “Boundary Layer” to increase the coolant flow momentum and accelerate heat transfer performance. The LIQTECH II features the new Aurabelt water block with addressable RGB lighting for vivid lighting effects. It can be controlled using the bundled ENERMAX RGB Control Box of via the motherboard. The LIQTECH II is certified compatible with ASUS Aura Sync, MSI Mystic Light, ASRock Polychrome RGB, and GIGABYTE RGB Fusion. 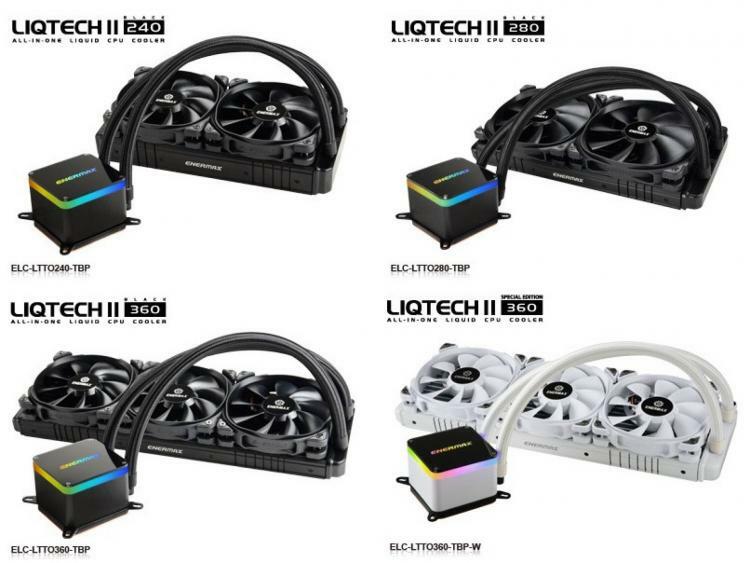 The LIQTECH II AIO CPU coolers come with high-pressure cooling fans to deliver the best possible heat dissipation. It comes with anti-vibration rubber pads on the four corners of the fan’s frame for noiseless and stable operation. The cooler also comes with 400mm flexible polyamide (PA) rubber tubes with premium-weaving which should be long enough to support most system builds. LIQTECH II 240 [ELC-LTTO240-TBP]: 129,90 € Manufacturer MSRP incl. VAT. LIQTECH II 280 [ELC-LTTO280-TBP]: 134,90 € Manufacturer MSRP incl. VAT. LIQTECH II 360 [ELC-LTTO360-TBP]: 149,90 € Manufacturer MSRP incl. VAT. LIQTECH II 360 White [ELC-LTTO360-TBP-W]: 159,90 € Manufacturer MSRP incl. VAT.